Aoyama has been around for 11 years. Since its opening, it has been serving its customers faithfully with an extensive variety of Japanese dishes. Over the years, Aoyama has moved into the Japanese fusion-food market, where it entices the adventurous to try the innovative dishes that are well thought of by Aoyama's chefs. They do not rely on their menu all the time, but encourage their customers to try out the recommended dishes, some of which are limited to a certain season/period of time, depending on raw ingredients' availability. Located at Desa Sri Hartamas, Aoyama is opened for both lunch & dinner, where most of their lunch crowd consists of workers from neighbouring offices, while their dinner crowd are mainly families who live nearby. The interior of the restaurant boasts a Japanese-fusion concept instead of the typical Japanese concept when they first started. Apart from the tables out at the open-area, Aoyama has a private function room that fits 20 persons comfortably for those who prefer to enjoy some private time with family & friends. This is a mini-size of 4 different cold dishes/appetizers. They're basically seafood dishes served in a platter of 4 types for those who would like to have a bit of this & that. Starting clockwise, you'll find the Tako Wasabi (Wasabi Squid). I find this an acquired taste as it is tangy (lemon-y) & the wasabi is quite evident. The squid pieces are chewy & quite interesting in taste. The dish next to it is the Sebu Kai (Shellfish) in one of their many made-in-house sauces. It's also quite a teaser to the palate ;) You'll also find the common Jellyfish with Sesame & the Marinated Baby Octopus. As both of it had the fragrance of sesame seed + sesame oil, those who love this aromatic ingredient will enjoy the dishes without a doubt. This simple yet famous dish was one really enjoyable snack. The fried shrimps were crunchy, flavourful & very addictive. Once you start on the 1st shrimp, you'll keep wanting to dig in & finish the whole plate on your own...perhaps have seconds! The 'must have' for a plate of crunchy shrimps: Karage powder! That's the powder used to deep-fry the 'pop-corn' chicken. Yums! This dish is a must-try! After digging into the sinful & yummy Ko Ebi, we were served a balanced & healthy plate of 2 salads. I love the sesame seed/goma sauce used for the suzuki fish salad & the various textures all in one salad! :D You'll find juicy tomatoes, crisp salad leaves, crispy fried beancurd sheets, & the fresh slices of fish & jellyfish. Really tasty. This is the one restaurant that I've come across prawn roe chawanmushi! *drools* You'll find a LARGE prawn (almost like a baby lobster) that's cut & pan-fried "teppanyaki-style" 'til it has that smokey taste & the prawn's roe is added to the sauce on top of the steamed egg. Yums. The prawns were nicely cooked (over-cooking it will cause the prawn to be hard & chewy like chewing gum) that the flesh is still "spring-y". The chawanmushi's texture is pretty smooth & firm, but it was a tad too salty. Hopefully they will reduce the salt in the future. The 'secret' is hidden in the tomato...foie gras & Shitake mushrooms! Wah, this dish is really sumptuous! It has all the "high-class" ingredients: Wagyu beef, foie gras & Shitake mushrooms. I love the different layers of texture from the tender & juicy Wagyu beef pieces (with the Teriyaki sauce), the soft & flavourful foie gras, the spongy Shitake mushroom, & even the juicy tomato + crispy "thin-sliced" deep-fried garlic! Fuyoh...really delish! This is for burger patty lovers. A combination of lamb & mutton, packed into a patty & pan-fried to perfection. Then, it is cooked in the sweet & savoury "katsu sauce", which is slightly sourish from the worcestershire sauce. The best part appears at the 'end of the show', where the patty is placed on a sizzling hot plate & a bowl of raw egg is poured onto the hot plate! Check it out..."lambton" burger island with a sea of eggs! Moist patty - bursting with flavours! The secret to the blue colour comes from the humble Blue Pea flower. The maki is named Celeste Maki as 'celeste' means "heavenly" & yes, it is quite heavenly indeed ;) The blue rice wraps a good portion of lobster salad & tempura prawns! Biting into it is just heavenly! The Volcano Maki on the other hand is indeed an explosive volcano experience in your mouth! The mayonnaise that you think is just "thousand island sauce" is actually a spicy home-made sauce primarily consisting of small, round chilies from Cameron Highlands (I suspect it's the Chiltepin, a type of small, hot pepper), Togarashi powder (Japanese chili flakes), tobasco sauce, salt & mayonnaise. Power! The maki comes with crabstick, cucumber & tanoki (tempura flakes). Thumbs up! This wasn't served to us but to another table's customer, who ordered it. We just thought it was really pretty, so we took the opportunity to snap a photo of one of Aoyama's many customized orders! I've never been a great fan of Shoyu Ramen, but I have to say that this one is actually very tasty! The broth reminds me of home-made ABC soup as the base of the soup uses chicken bones, radish, onions, leeks, & Kombu (a type of edible kelp that's widely used in East Asia). It's a must try if you love ramen & naturally-sweet tasting soup :) They only serve 10 bowls per day - so do make your reservation! This is the spicy version, where the same chili paste that's used for the Volcano Maki is used in this soup. I find it "burning"! It's either my tolerance towards spicy food has taken a dip or it's REALLY spicy! Like a "ma lat" (numbing spicy) soup! Each bowl of Kyushu Shoyu Ramen comes with sweet corn, peas, golden mushrooms, black fungus, half a boiled egg, sesame seeds & 2 pieces of chicken rolls (chicken thigh that's rolled-up with ingredients & steamed, before it hits the grill with some Teriyaki sauce). When you're feeling down & blue, come over to Aoyama for their Ocean Blue ice-cream! It'll certainly cheer you up, especially if you love some cold, smooth ice-cream with a touch of sea salt! The blue colour is from the same Blue Pea flower & this ice-cream just reminds me of salted caramel. Quite interesting. The Macha Red Bean ice-cream is one of my favourites. It has a very evident green tea taste, slightly bitter, but feels very refreshing. Love it! The Vanilla Yuzu is something very unique as well. I was expecting a strong Yuzu flavour, where it's very sour & slightly bitter, but this one was really mild. It's more fruity than sour/bitter as they add Yuzu sake into the simple vanilla ice-cream, to give the ice-cream a mild alcoholic fruity-twist! Yummy! For those who have yet to try Aoyama, they're currently having an Udon/Soba lunch set promotion, with 4 different sets to choose from at RM9.90+/set. Each set comes with a side dish of your choice & a bowl of miso soup. Give it a try! Business hours: Mon - Sat: 11:30a.m. - 2:30p.m., 6:00p.m. - 10:30p.m. & Sun: 11:30a.m. - 3:00p.m., 6:00p.m. - 10:00p.m. 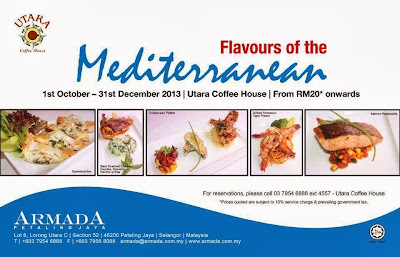 The Utara Coffee House of Armada Hotel Petaling Jaya is inviting you on a journey to the Mediterranean through their selection of dishes, featuring Flavours of the Mediterranean :) Enjoy a variety of dishes with the Mediterranean touch from 1st October - 31st December 2013 at really affordable prices, starting from RM20.00++ a dish. The spread features dishes from France, Greece, Italy, Spain & more. Extra virgin olive oil, tomatoes, olives, yogurt, cheese & seafood are key ingredients for Mediterranean-style dishes. So what are the dishes featured, you would wonder? If you've a pie/pastry-lover, you'll love to sink your teeth into the crispy Filo pastry snack that wraps the medley of feta cheese, spinach & onions :) Inspired by the Greeks, this snack is very flavorful, fragrant & fresh to the palate. A southeaster France specialty, this dish features a piece of succulent chicken breast roasted with fragrant red peppers (paprika) & basil, & served with black olives & basil cherry tomatoes. Garlic, tomatoes & olive oil make up the "tomato salsa look-alike" to give the dish a tangy touch. Enjoy a trip to Turkey with this tender racks of lamb (New Zealand lamb) that's marinated overnight with black pepper corns, lemon & rosemary. The dish is served with cinnamon raisin rice to complete the meal :) I felt that it could do with more 'juice' as it was a tad dry although still tender & pink. Expect a freshly grilled large tiger prawn lying on a bed of pesto spaghetti, ready to be enjoyed by a hungry someone...ah, who can resist such 'invitation'? The prawn is cooked in the Romesco sauce, a nut & red pepper-based sauce from Tarragona, Catalonia, Spain, then topped with almonds, pine nuts, roasted garlic, roaster tomatoes, & extra virgin olive oil. Paired with the pasta, it's indeed a dish bursting in flavors in every bite. Perfect for those who love some "lean & mean" poultry dish for a meal., this generous piece of chicken breast is pan-fried & served with some spinach risotto with some 'attitude' ;) The risotto is cheesy but not over-powered by cheese - you'll just keep digging in for more! It accompanies the light, peppery chicken breasts, making the dish simple, yet sophisticated at the same time. We often hear the phrase, "save the best for the last" & yes, we had the opportunity to also taste Utara Coffee House's Carrot & Pineapple Cake! It didn't have as much grated carrots as I have expected & the taste of pineapples aren't very evident, but I can testify that the Mascarpon cheese topping + the "brown sugar" taste in the cake were not too bad a combination. It's a good dessert for those who like something not too sweet, slightly salty (from the cheese) & slightly tangy (also from the cheese topping). 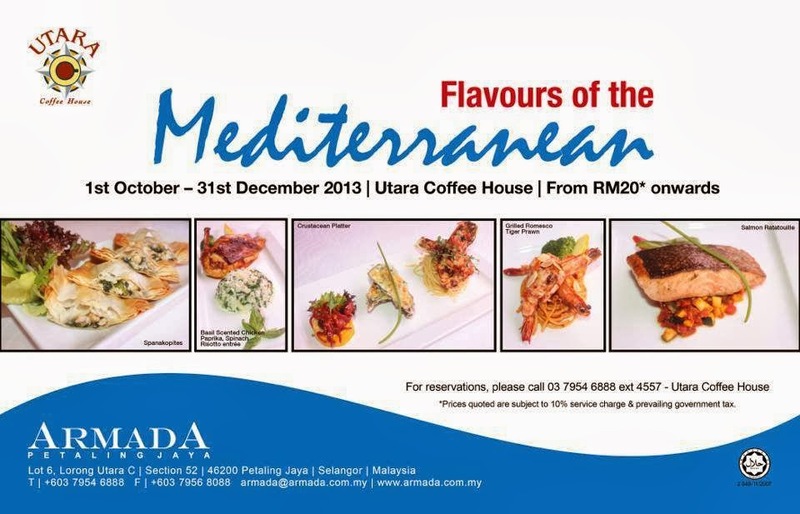 Head on to the Utara Coffee House to satisfy your cravings for Mediterranean cuisines. The prices are very affordable & you'll get to dine at a comfortable & relaxing ambiance restaurant as well. Enjoy!